Season 4 of The Magicians kicks off in the aftermath of magic’s return, focusing its various energies on a world where the source of everyone’s power is siphoned off and regulated by an authoritarian regime, claiming to have the “people’s” best interests in mind. It’s not hard to see where series executive producers Sera Gamble and John McNamara are drawing their inspiration from, in addition to the novels by Lev Grossman, but even as the series touches on fears of fascism it never forgets that, at heart, it’s also a fantasy tale that’s as sweeping and potentially epic as any other franchise centered on the misadventures of some enterprising students at a school for magic. To that end, The Magicians aims to shake things up a bit in season 4 with more than a new world order that sees the Library doling out magic as it sees fit. The series also begins with the core group of Brakebills students, Quentin (Jason Ralph), Julia (Stella Maeve), Penny (Arjun Gupta), Margo (Summer Bishil), Kady (Jade Tailor), and Josh (Trevor Einhorn) under the spell of some powerful magic that has them living out very different lives. Meanwile, Alice (Olivia Taylor Dudley) is still a prisoner of the Library (sharing a cell wall with Santa Claus, of all people), and Eliot (Hale Appleman) has been possessed by an ancient, childlike, and all-powerful entity known simply as the Monster. It’s as complex a narrative knot as the series has attempted to untie, and from the start of ‘A Flock of Lost Birds,’ it may also prove to be one of the series’ most fulfilling. What’s appealing about the season premiere is the sense that it’s starting over. After Alice’s betrayal (an understandable one, but a betrayal nonetheless) late last season that saw her stymie her friends and classmates’ efforts to turn the flow of magic back on, and the group subsequently having their memories wiped, the season 4 premiere is largely about getting the band back together. The thrill of building a team is everywhere in what proves to be a dark premiere, as Kady slowly discovers her life as an undercover narcotics officer might be a sham after an investigation into the Hedge Witches leads her to a graphic novel recounting her fake life. Kady’s investigation leads her to gather Margo, Josh, and Penny (23) in an effort to understand what, exactly, is going on. The only drawback is the way in which the episode yadda-yaddas a lot of potentially interesting story in an effort to free this group from the spell they’re under. While their identities are nothing more than illusions, it would have been nice to see a little bit more of DJ Hansel, Janet, Sam, or the Uber-driving Isaac. And while the spell is certainly not broken by the end of the first hour, the false identities are fully aware something’s not right with their lives and have already taken steps to correct what’s wrong. That leaves these new characters as what they were intended to be: shells covering up the true nature of what’s underneath. And while it makes sense that Gamble and McNamara would want to get the core group of characters back to themselves as quickly as possible, it’s hard not to see the hasty manner in which The Magicians attempts to re-establish a kind of status quo as a missed opportunity to explore some deeper truths that only come to light through the lens of an illusory identity. It’s clear The Magicians has bigger fish to fry, however. That as much is made evident by Brian (Quentin) going on a murderous journey with the Monster (Eliot), who has so little compunction for killing that he slits the throat of an ice cream vendor after misunderstanding that jimmies are sprinkles. 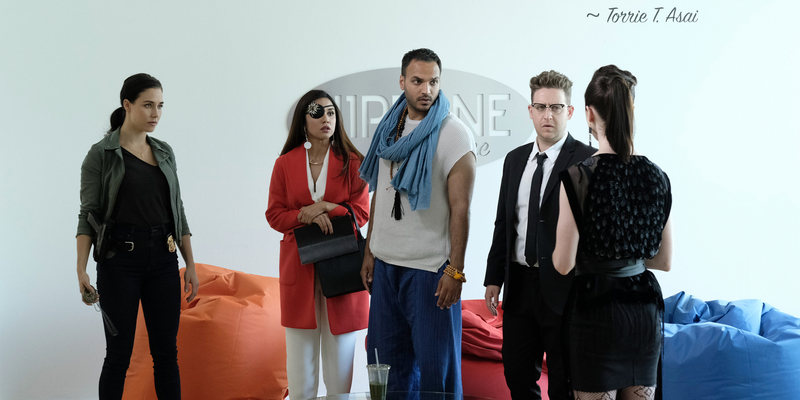 As one of two main plots for the season, the Monster poses an interesting threat in that raises the stakes for the show’s core group, and certainly for Eliot, who has unwittingly found himself the host of the powerful entity. Moreover, even as the others’ identities are bound to come back, there’s an interesting question of when and how Eliot will return, if at all. That, in and of itself, gives this new season an air of unpredictability, one that’s heightened as it becomes clear the main characters are not only facing down a nigh-invincible entity, but also a monolithic and all-powerful bureaucracy in the Library. Splitting the plot like that would normally feel counterproductive, but considering the series has such a large cast, the seemingly divergent narratives offer a welcome level of intrigue for the various characters. Perhaps because she’s still herself and has a lot to account for, Alice’s efforts to break free from the Library’s prison makes for a compelling start to her season’s arc, one that’s enhanced by the presence of a downtrodden Santa Claus. The same goes for Dean Fog, who finds one of his former students, Julia, has returned to him in the form of Brakebills freshman student, Kim. As the start of the new season, ‘A Flock of Lost Birds’ does a lot of heavy lifting that could have been spread out over a few more episodes. But given the apparent scope of the new story this year, the idea that The Magicians is erring in order to get to the good stuff sooner may well prove to be the right decision. At any rate, this is an exciting start - and new beginning of sorts - of a fascinatingly dark chapter in the series. The Magicians continues next Wednesday with ‘Lost, Found, F***ed’ @9pm on SYFY.